"Hi dro chloric." The alchemical name tasted foreign in my mouth. "And that is the strongest acid you have?" I didn't want to take any chances with the trolls. Tired of arming yourself with plain old acid? Looking for new weapons to use against Black Dragons, Digesters and other acid immune creatures? Looking for new ideas to create different creatures and traps? 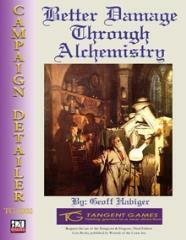 Better Damage through Alchemistry is a short book for use with the Dungeons & Dragons, 3.5 Edition rules. Within you will find new ways to liven up your game and breath new life into the Craft (Alchemy) skill. The article contains descriptions and rules for creating and using three types of acids, three types of bases, and 13 natural elements and other alchemical items that are very dangerous in the right (or wrong) hands. Better Damage Through Alchemistry was the first installment in the highly popular Campaign Detailer Series, a series of bargain-priced products designed to help liven up your d20 System game by providing you with new and detailed crunchy bits along with new ideas that enhance existing facets of your gaming experience.